A lot of you actually have been asking me to go for facial because of my current skin condition (a lot of pimples and scars), but there are also a lot of you asked me don't go for facial because of my current skin condition (too serious and too sensitive, might be internal problem). Yes of course, I did go for facial before, but it was back in secondary school period, did by my mom (yes she used to be a beautician). But my skin never recovered after undergoing so many times of painfulness and down period (red skin and more scars after the extraction), so I thought that facial is one of the reason that worsen my skin. Few weeks ago, Edeve Skin Beauty Salon approached me to review on their facial service, which I personally think that it's a great opportunity to give myself another chance to try out facial service after so long! Edeve Beauty Salon is located along Jalan Tun Mohd Salleh Ismail (Farlim Area). It's actually a housing area but you can see the huge banner of the salon between the houses. There are plenty of parking spaces in front of the building. The salon itself is very clean and tidy, feels very comfortable. The whole look makes me feel like they are very professional. One thing that makes me decided to go for their facial service is because of the products brand they used - Dermalogica! Like, who doesn't know about Dermalogica?! It's a great chance for me to try out not just the facial service but also the products! The corridor where my facial room is just on the left. Not sure if you realized in the middle is a door opens to washroom? The facial room for one person. The facial room for 2 persons. The Dermalogica products used for facial service, depending on your skin type and conditions. Now let me brief through the process that my therapist, Evelyn did for me. (3) extraction where they help you to squeeze and extract out the blackheads on your skin. The special part about their facial is they only use their bare hands to do the extraction instead of the typically round metal that people used to squeeze blackheads! Because using the metal to squeeze the skin is more painful than using hands, it will hurt the skin tissues even more and might even cause scaring on the skin! This is true because every time my skin will hurt and scar even more after doing the extraction with the metal, and that's why I don't like to go for facial. (4) antiseptic with the Neon Light machine. 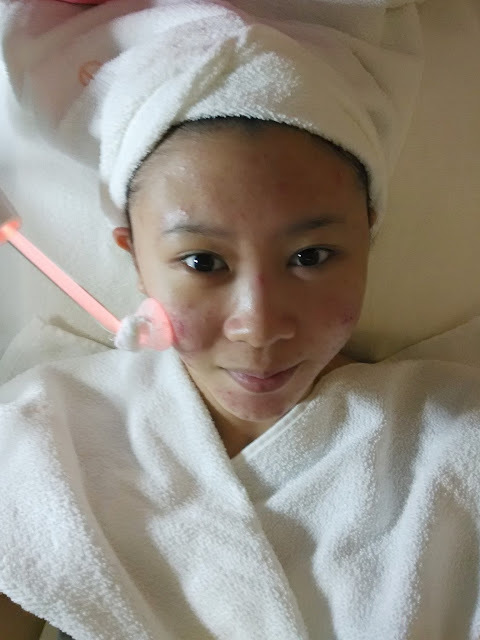 The Neon Light will not just helped in antiseptic but also help to avoid inflammation and reduce redness on my skin after serious extraction. You will need to expect some stinginess if you're having serious skin problem like me. This process is mainly for those who has serious skin condition like me, and for those with lesser skin condition, she will only help you to apply antiseptic product. There are 2 types of massages - the Pressure Point Massage is for skin with lots of congestion (like me), and the normal Face Massage is for normal skin condition. The massages not only involved on the face but also the eye area and neck area. (8) Cold treatment using their machine. 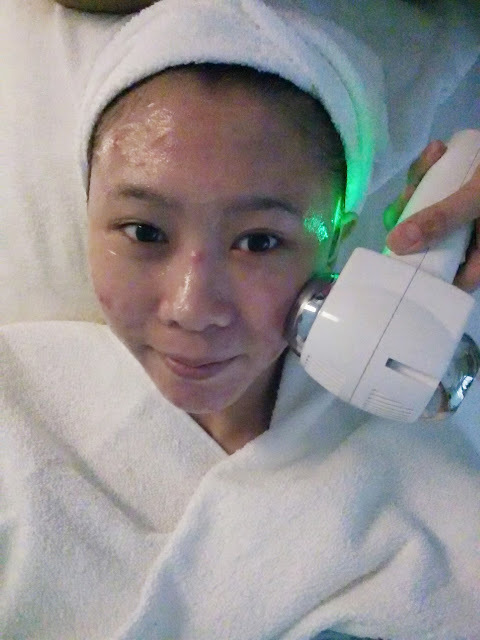 The treatment product is not really cold when it first applied on my skin, but after the machine touched on my skin, it's super cold! I love this process the most because I always love to apply cooling products on my skin, makes me feel that my pimples, acne and pores will be reduced instantly by the low temperature! (9) apply Cold Hard Mask. At this step, you'll get to relax for about 15 minutes to half an hour with the cold hard mask. And after the whole process has ended, Evelyn helped me to apply tinted sunscreen to protect my skin from the harmful UV. Flower tea was given after finished with my treatment. For this whole process, normally it takes two hours to two and a half hours depending on how much time it took to do the extraction. As mine needs more time to do the extraction because I rarely went for facial and I have really A LOT of blackheads! So this whole process took me two and a half hours. Gift from Edeve! Finally get to try out dermalogica products! So far I've been loving the cleanser so much! Hopefully these products will help to improve my skin condition! After this one time facial experience, I felt like going back for another treatment again, especially when I know that they use bare hands instead of metals to do the extraction, and also because of the brand Dermalogica! In overall, the service is very good and calming. I can say that I had a good experience here in Edeve. And by knowing the products and machines they used, I think that their treatment is worth the price! Evelyn, the lady boss. Thanks for the awesome service. The facial treatment price range starts from RM88. If you mention that you are recommended by me (Nicole Yie), you can get 50% off on facial treatment starting from the price of RM198, which means you get to enjoy the facial service worth RM198 at only RM99! Other than facial treatments, Edeve also offer waxing treatments for face and body. So if you're interested, please do not hesitate to go for free consultation by them! I love the place. look exclusive too. Dermalogica indeed a good brand to use for skin.